Are you looking for a personal stylist for women’s clothing for the upcoming year? Look no further. We’ve compiled a few Easton looks for the 2019 year that can help you start the upcoming season off right. Our first Easton personal stylist pick in women’s clothing is the Wish Untouchable Jacket. This jacket has a sleek biker chic vibe. It comes equipped with a mid waist belt in a subtle soft pink color. The arms have zippers to adjust the length on the arms for your comfort and pockets for carrying a small clutch and your phone. 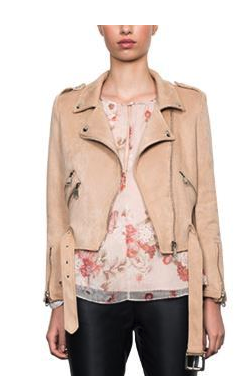 This jacket will bring a classy chic rock vibe for traveling on your bike or under the city lights. Perfect for a date night. The second pick on our list is the Easton Fifteen Twenty Long Cardigan. This is offered in black with five buttons along the left-hand side of the cardigan. It is great for an evening walk, a night with the girls, or simply getting cozy at home. It can also be used for a business casual meet up if you are a busy woman at work. Our third pick for women’s clothing is the Fifteen Twenty Ankle split Pants. This is offered in pinstripe black and white. It can be paired with the Fifteen Twenty Long Cardigan for a great business meeting or you can choose to wear them separately for a nice night out on the town. This brings a subtle classy look to any professional meet and greet and will go well with family get-togethers for that classy lady. Let us continue bringing you personal stylist tips at the click of a button for you to enjoy and share with others. Please be sure to check back in each month for more updates and new looks. Enjoy your new year with a bang!